Cambria is full of art galleries, gourmet restaurants, and scenic lodgings, and your decision about where to stay depends on which area of this majestic town you want to visit. Beach hotels offer scenic vistas while village hotels offer charm and a convenient location. All accommodations are within short traveling distance of such attractions as Hearst Castle and Paso Robles wine country. The following hotels are all located along Moon Beach Drive, only a step away from the beach. As well as hiking along the many trails, you can watch elephant seals and migrating whales. If you fancy some culture, the center of Cambria village is only a short drive away. A reviewer summed up the beauty of this hotel when he said, "On approach, the Sand Pebbles Inn is sublime. The dove gray facade oozes the understated and chic sophistication I am accustomed too." That class is continued inside with fireplaces, a deluxe continental breakfast and ocean view rooms with refrigerators, flat screen TVs, and DVD players. Rooms range from $144 to $239, which makes this hotel a good place for cheap beach vacations. Moonstone Landing offers extraordinary ocean views and an outdoor spa. Each room, complimented on Trip Advisor for being spacious, includes a fireplace, Internet access and a microwave. Guests can also enjoy scenic vistas, an extensive continental breakfast, and afternoon complimentary beverages, as well as tickets to Hearst Castle and outstanding service. As one reviewer stated, "Moonstone Landing is very homey. We will stay again and again." This hotel offers rates between $150 to $265 a night. 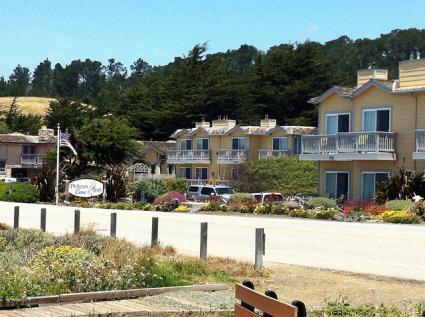 Pelican Inn is a luxurious, four-star Moonstone Beach hotel with fireplaces, Wi-Fi and king-sized beds. Amenities include a continental breakfast, afternoon cheese and wine, and in-room refrigerators, as well as an outdoor spa, a special wine tour, and deluxe hotel rooms with exceptional views. One impressed customer stated, "When we got to our room, we found a lovely fire lit, a bottle of champagne for our honeymoon, and lots of cute towels in the shape of hearts." Rates at the Pelican in range from $160 to $330. 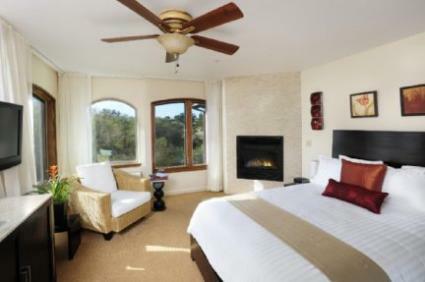 The Sea Otter Inn offers beautiful fireplaces in their charming country style rooms and suites. Visitors can enjoy an outdoor swimming pool and spa, as well as a continental breakfast and in-room refrigerators. Even though you won't have a view of the ocean, the inn has magnificent vistas, and the beach is only a five minute walk away. One reviewer stated, "The place is charming and immaculately maintained. The rooms are large, modern and clean, with super comfortable beds." 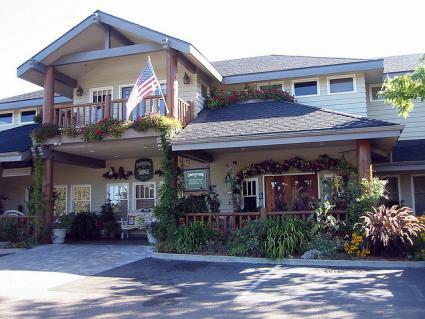 The Sea Otter Inn offers rates from $129 to $199. Oceanpoint Ranch spans an impressive and glorious nine acres of plush, landscaped terrain that includes a par three golf course. With a large pool, continental breakfast, cable television and Wi-Fi, as well as croquet and shuffleboard, San Simeon appears to be a good place for a family vacation. 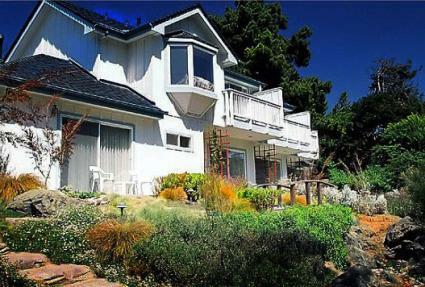 Its location on the beach means you have excellent access to activities such as whale watching. Country-style cottages are also available. Not everyone appreciates this resort's rustic feel. Some reviewers on Trip Advisor said the place felt like something from the 1960s while other guests really liked the ambience. As one reviewer said, "We have stayed here many times, and I expect this won't be our last visit. 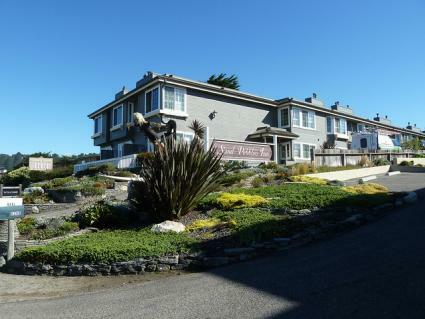 The state park is directly across from the hotel, so you only need to leave your room to have access to all the seaside wonders of Moonstone Beach." Rooms at this resort range from $124 to $140. Groups and event info: 1 (805) 927-4395. 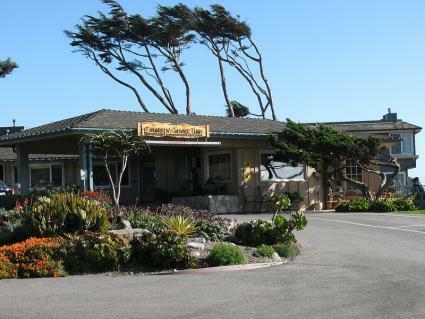 Cambria Shores Inn is a delightful retreat with what many visitors consider the best view on Moonstone Beach. This third generation, exclusively family-owned inn has been attracting visitors for ages. Guest service includes delivering breakfast to your door in a basket, and one reviewer stated, "The staff also, "...serves cookies at 3:00 p.m., vegetables, cheese and crackers at 5:00 p.m., and fresh homemade brownies at 6:00 p.m."
Dog-friendly accommodations make this inn a nice place to bring pets, but they also provide separate, animal-free accommodations for guests who prefer or require them. Their king rooms, queen rooms, and deluxe rooms are equipped with refrigerators, coffee makers, microwaves, and flat screen TVs. Guests will also appreciate the in-room wireless internet and DVD players with 200 free movies to choose from. Rates at the inn range from $239 to $259. The following hotels and inns are located in or very near the center of Cambria Village. Here you find a variety of events and activities throughout the year, including farmer markets, Hearst Castle, galleries and spas. 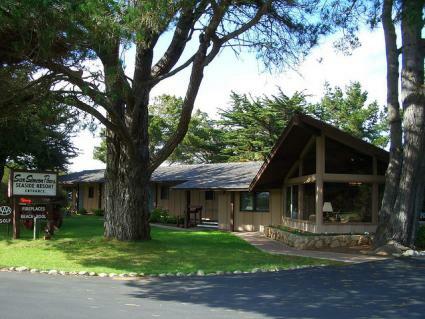 Cambria Pines Lodge is set on 25 majestic acres and offers exceptional accommodations, including suites, rustic cabins, and motel rooms. With a complimentary breakfast, special wine tours, extensive conference rooms, a restaurant with its own organic garden, and an indoor heated swimming pool, Cambria Pines Lodge is an eclectic and popular option. One reviewer described a great evening he had just staying at the hotel. "Dinner was outstanding," he said, "the local wine, which was gratis, was enjoyable. We retired to the lounge afterward and enjoyed a live band and after dinner drinks." Rates at the lodge range from $109 to $399. Bluebird Inn offers quiet and very comfortable accommodations amid a beautiful garden. The creek-side setting creates an unprecedented ambiance. The country decor is nice, and new rooms with fireplaces are available, as are the original rooms. Both options provide a charming and cozy place that Trip Advisor rates five out of five stars. "Great room. Great company. Great breakfast! Five star rating!" said one reviewer. The rates are very affordable, and they range from $58 to $220. 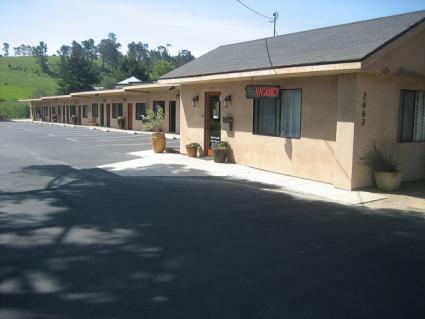 Cambria Palms Motel offers 18 non-smoking rooms on the ground floor. This motel is situated in a fabulous country setting on Main Street, only a short stroll from the center of town and 12 miles away from Paso Robles wineries. If you want transport for the beach, you can rent one of their beach cruiser bicycles. "This motel on the edge of town isn't spectacular by any means," said one reviewer, "but somehow it all comes together." This family-owned motel offers exceptional rates, which range from $79 to $129. Her Castle is a high quality bed and breakfast, judging from the list of awards it has won. The two guest rooms, The King room and The Queen room, have fire places and Wi-Fi. From their viewing decks, you have a great overview of a redwood forest. "Our room, which was the Queen room, was spacious, comfortable, and incredibly well equipped," said one reviewer. "On arrival, there was bottle of wine chilling in our fridge and 15 minutes after arrival, Eleanor appeared with her trays of appetizers." Prices range from $130 to $170 per night. The El Colibri is one of the few hotels in the area that can provide a short break from normal life. The hotel has a wine bar fully stocked with the best vintages from nearby Paso Robles wine country, as well as a full-service spa with outdoor Jacuzzi and whirlpools . Each of the 34 rooms have deep soaking tubs, gas fire places, Wi-Fi and flat screen TVs. "We had massages every night, which was a truly relaxing experience," said one reviewer. "We will go back again!" Prices at the El Colibri range from $165 to $365 per night. 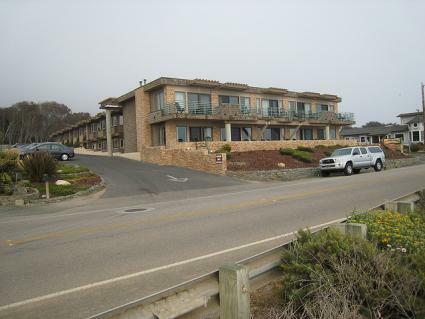 If you want to stay in Cambria during the autumn or the late winter months, you should have no problem booking a room. During the busier spring and summer months, you will have to book well in advance. With its range of activities and wild life, Cambria is an increasingly popular destination, and even rooms at smaller bed and breakfast establishments are quickly snapped up. Get there first, and you will be one of a select few who can enjoy the splendors of this exotic village location.